Here is the original, unedited version of an article I wrote for SageWoman magazine, which was published in the current “Wisdom of Water” issue, sent out at the end of December 2018. She is the fingerless, (hu)man-hating, icy, Inuit goddess of the sea. She is the benthic “Big, Bad Woman” and the transfigured mother of marine mammals. Her palace is made of whale bones and lies beneath the bottom of the Arctic Ocean. She is the punisher of broken taboos and disrespect to nature. It’s plain to see that Sedna is not a warm or welcoming goddess, but I felt her pull as strongly as a fly pulled to a porch light. No chthonic deity has ever really reached out to me, and it was no surprise that this was the one who finally did speak directly to me, as she is both an ocean and an underworld goddess. Indeed, the two are hardly separable. The ocean – water itself – is everything. Not only in my personal spiritual practice but for all the world and her inhabitants, on all levels. It is life and death. Sedna is both Life and Death. She wants to hide the seals from us. Set matters right will I. Should too many of her sacred taboos be broken, should there be disrespect and abuse of nature and of women, Sedna would draw the seals and other sea creatures the People depended upon down to her palace. The shaman, or angakkuq, would then have a most unenviable task; he would need to journey down to her palace to set matters right, to appease her wrath and comfort her so that she would release the animals who would feed and clothe the village. This was accomplished by combing out her hair, which became knotted and tangled when her laws were broken. Because her traitorous father chopped off her fingers (during the tragic event that would turn her into a goddess) she was unable to do it for herself. If, for whatever reason, the angakkuq failed to appease her, he could be lost to her abyssal graveyard forever. When I first began to learn about Sedna, I immediately related with her and her story, and I felt that she was summoning me. At first this was somewhat intimidating, as she is not very welcoming of visitors in the best of times. However, she indeed was the one calling me. Loudly. Her taboos and all manner of natural laws have been broken to bits for ages now, countless crimes against nature, women and all life sending her into a constant rage, yet no angakkuit have been coming to see her, not like they used to. By my own earthly, given name was she calling, specifically the literal meaning of that Welsh name – “Protector of the Sea”. “Will you live up to that name?” she seemed to be asking. I don’t know how long a pre-Christian Inuit angakkuq would train and prepare to even be able to make the journey to Sedna, but I did learn that female angakkuit, while rare, were typically much more powerful than males. Perhaps this aided me in my efforts, but it still took no fewer than three tries – three separate journeys – to make it to and into Adlivun to commune directly with Sedna. The first journey took me to the Arctic and showed me the path down to her palace. It consisted of three obstacles beginning with a whirlpool on the frigid ocean surface. This was the portal down into the sea, deep into the darkness, until reaching a long, deep trench that must be followed and then penetrated to reach an even deeper, darker sea. Then, even from a distance, it was clear what the final test was; the classic beast at the threshold; a dark, looming silhouette against the phosphorescent glow the massive whalebone arches. The second journey, still consisting of entering through the whirlpool, down to the trench and through it to the underworld, took me closer to the guardian at the palace door. It resembled a huge, terrifying yet beautiful three-headed woman with the lower body of a dragon or sea serpent. The guardian told me that to enter the whalebone gates and speak to Sedna, I would need to make a third journey, this time returning with a Venus Comb murex. A Venus Comb (Murex pecten) is a seashell, so named for the dramatic spines all around it’s exceptionally long siphonal canal. Since spring of 2017 I have been studying Michelle Hanson’s Ocean Oracle: a 200-card oracle deck featuring 200 different seashells and the meanings that she has received from them over decades of both biological study and meditation. I have also had the pleasure of frequently corresponding with her via email, as she does with students taking her certification course, developing a friendship as well as a student-teacher relationship. She lives only two states away from me and when she learned she’d be stopping very nearby on her way North, we planned on meeting in person for the first time. It was shortly after this that I had made the second journey and was told to come back with the murex. Michelle had emailed me, asking if there were any particular shells I would want to see when we met, and I replied listing several favorites. I tried my luck a bit further, asking if she happened to have an extra Venus Comb I could buy or borrow. At first, she replied saying she unfortunately had only the one in her personal collection that she used for readings. She then asked if I wouldn’t mind explaining why I needed it, wondering if using the card from the deck (which also bears the shells energy and is useful in various workings) would suffice. I related my journey and my instructions to bring back a real one and she agreed that, in this case, the picture alone would not do. It was not only, as I understood it, a test of devotion for me to find and return with one. 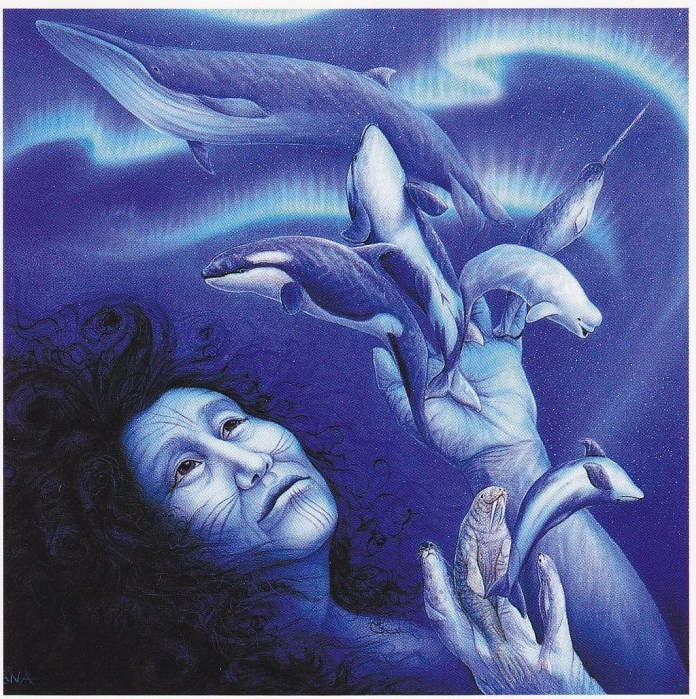 It would also be the token and tool by which I would complete my version of the angakkuq’s task of combing Sedna’s hair and communing with her. Not two days after Michelle’s initial response and referral to a website where I could try to buy one, she wrote back again with surprising news. She remembered some boxes in her basement which contained several other “extra” shells and happened to find among them a beautiful Venus Comb murex that she didn’t even know she had. We met shortly after that, and she presented me not only with the near-perfect Venus Comb, but a handful of precious shell gifts (all deliberately chosen for me for their meanings), most of which now rest under the gaze of a mermaid goddess on my ocean altar. The third journey down to Sedna was one of the quickest and easiest, and the imposing but familiar guardian was immediately accepting of me and my murex. In her guidebook, “Ocean Oracle: What Seashells Reveal About Our True Nature”, Michelle describes the meaning of the Venus Comb as “healthy self-centeredness, self-love, focusing on one’s needs, discovering and living one’s truth”. This meaning was echoed in the energy I felt attach itself to the shell once I took it to Sedna. It is now not only symbolic of an actual comb to repair her gnarled hair (an act which itself is both literal and symbolic) and a powerful key to her realm and the understanding she imparts. It’s also a token of love for Sedna and the Earth, and of self-love. Sedna knew her self-worth when she left an unhappy and misleading marriage, even though that only led to another disaster in which her father turned from rescuer to executioner. But even that final struggle and heartbreak transformed her into a mighty goddess forever. It is only when we truly know and love ourselves, and honor our personal truths, that we can learn to have divine love for our precious planetary mother and stand up to defend her. But it is only through Earth itself – spirit, nature and magic – that we come to know ourselves. So, the answer is always to return home, and to ourselves; return to the Great Mother and nurture that which nurtures us, completing the sacred circle.